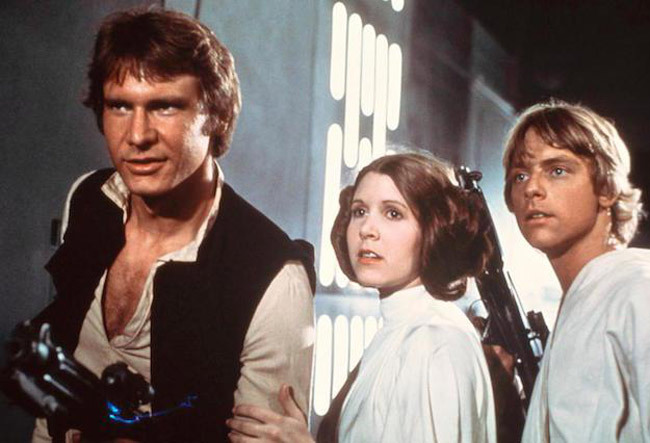 The original Star Wars, which would go on to win seven Oscars, was released by 20th Century Fox on this day in 1977. Today: Mostly sunny. Highs in the mid 80s inland, in the lower 80s on the coast. East winds 10 to 15 mph. Tonight: Clear. Lows in the mid 60s. East winds 5 to 10 mph. Details here. Today’s fire danger is moderate. Flagler County’s Drought Index is at 118. The OED’s Word of the Day: ablow, adj.1. –Erich Maria Remarque, “The Road Back” (1931). The Flagler County Economic Opportunity Council meets at 9 a.m. in board chambers at the Government Services Building. The meeting will be followed by a workshop in the Finance Conference Room, 3rd floor of the GSB. At the 9 a.m. meeting, Toby Tobin will present a report on behalf of the Flagler Home Builders Association, and Margaret Sheehan-Jones will report on commercial real estate. The council will discuss the county’s workforce and talent. The Flagler County Parks and Recreation Advisory Board meets at 10 a.m. in the first-floor conference room of the Government Services Building. No agenda was posted online. Flagler Democratic Community Spaghetti Dinner includes salad and garlic bread; Take-Out or Sit-Down; dessert auction fundraiser; Sponsored by Democratic Executive Committee; $10.00 per person. Reserve advance tickets by calling 386-864-1510. At the Palm Coast Community Center, 305 Palm Coast Parkway NE, starting at 6 p.m.
Ribbon-cutting: Vanacore Homes, Chestnut Model, 21 Pheasant Dr., Palm Coast, at 4 p.m. In Latest Reversal, Sheriff Manfre Does Not Appeal Ethics Judgment as Deadline Passes: Flagler County Sheriff Jim Manfre has not appealed the Florida Ethics Commission’s latest judgment against him after all: that deadline passed on Friday. That means Manfre will concede to a $6,200 fine and a public reprimand and censure that the ethics commission approved on April 15. Flagler’s Third Graders Improve English Skills and Climb to 10th Best in Florida: The proportion of students who scored a 3 or better (out of 5)–that is, students who are proficient in English at their grade level–also improved, from 60 percent to 63 percent. Ex-Traffic Homicide Prosecutor Ray Lee Smith Joins Flagler Bench as Family Law Judge: Smith, 43, a Ponte Vedra Beach resident, presides over family law cases in Division 47 and fills the vacancy created by the retirement of Judge J. David Walsh earlier this year. ♦ May 26: Graduation ceremonies for Flagler Palm Coast High School and Matanzas High School seniors are scheduled in the same venue this year, at the Ocean Center in Daytona Beach. The Matanzas ceremony begins at 4:30 p.m. (doors open at 3:30 p.m.), the FPC ceremony at 7:30 p.m. (doors open at 6:30 p.m.). The Ocean Center is at 101 N Atlantic Ave, Daytona Beach. ♦ May 26: Flagler County Commissioner Nate McLaughlin hosts a town hall meeting at 5:30 p.m. at the Hidden Trails Community Center, 6108 Mahogany Blvd. Bunnell. ♦ May 31: Entrepreneur Night at Sunsetters Riverfront, 115 Main St., Daytona Beach. Join over 150 entrepreneurs, startup founders, investors, and supporters of entrepreneurs. Expect a terrific atmosphere, complimentary appetizers, cash bar, fast pitched sessions, peer-to-peer connections, conversations, networking, entertainment, and surprises. 5:30 p.m.
♦ June 1: Flagler County Emergency Management makes a presentation at the inaugural “Hurricane Preparedness Breakfast” being hosted by Flagler Volunteer Services. The breakfast will be held from 8:30 to 10:30 a.m. June 1 at the Hilton Garden Inn. The Irish pianist Finghin Collins plays one of the superbly understated nocturnes by John Field, the late-classical Irish composer who wrote plenty of works for piano and orchestra and piano solo but is remembered, when remembered at all, almost exclusively for his nocturnes. You may have to close your eyes to this one: Collins’s piano-playing is unbearably affected, like a selfie in motion. But the execution is better controlled. John Field – Nocturne No. 10 in E Minor from Finghin Collins on Vimeo.